· POU filtration system placed at the household’s sources of drinking water. · Designed for reduction of chemical contaminants. · Chosen by the EPA in lieu of bottled water in emergency situations and for use at the 1200 most contaminated superfund sites on the EPA’s National Priorities List. · Up to 99% effective at removing EDG, TCE, PCE, THM and other dangerous chemicals from drinking water. · Effectively removes chlorine, foul tastes and odors. · Provides pure, safe, great tasting water. · Other system configurations include: Removal of heavy metals, lead and mercury, ultra-violet add-on to destroy bacteria, and removal of heavy sediment. 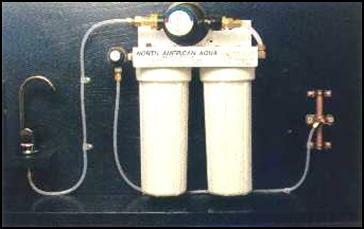 The filter cartridges are proven effective for up to 1,250 gallons of use, or about a full year for an average family. The system features a built-in “Effective Life Indicator” to monitor usage and automatically shut off the water supply at 1,250 gallons use. The user is thereby reminded to replace the filter cartridges. The system requires two carbon cartridges. These cartridges have an integral sediment filter which removes dirt, rust and other suspended particles of .5 micron size and larger.